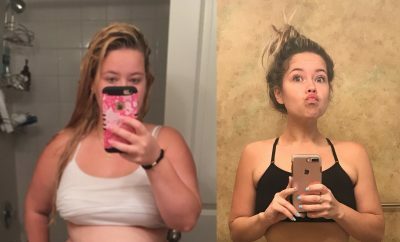 Ali Vincent’s fundamental attitude–“believe in yourself”–has helped her keep off the 100-plus pounds she lost on the Biggest Loser. My name is Ali Vincent, and I am the Biggest Loser. I still love saying it. 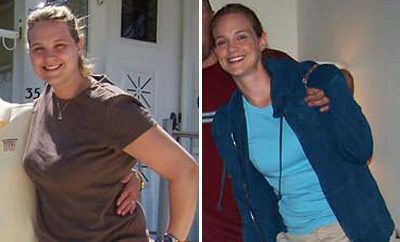 In October 2007, when I joined season 5 of The Biggest Loser, I weighed 234 pounds. At the finale, I registered a loss of 112 pounds. Nearly half of me had vanished. Millions of people watched my journey, but there’s a lot more to it than what you saw on TV. Behind my extra pounds were issues I needed to explore before I could change my life for good. I know that when people come to hear me speak, they think I’m going to delve into eating and exercise strategies–but my success is more than just about calories in, calories out. It’s how I learned to believe in myself again. I grew up in a Mormon community with a strict moral code. In Sunday school, I was taught that parents should be married (and Mormon) and no one should drink or smoke. What I had instead: divorced parents, a Catholic dad, and a mom who partied a lot. I acted out in my teens and started gaining weight right after high school. It was only a few pounds at first, but I felt huge. I was convinced my boyfriend stopped loving me because of it. As I watched the numbers on the scale climb, I started to withdraw. After a difficult time in my early 20s–I lost my grandpa and my dog, and I was unemployed–I just gave up. I felt empty. So I ate and ate, but nothing filled me up. I was so far down an emotional black hole that I didn’t know how to get out. 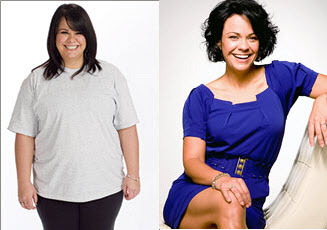 Adapted from Believe It, Be It: How Being The Biggest Loser Won Me Back My Life, by Ali Vincent. Copyright 2009 by Ali Vincent. By permission of Rodale Inc.,Emmaus,PA18098. Available wherever books are sold. After a few months and a long application process, my mom and I joined the cast of The Biggest Loser: Couples. We both had a lot of weight to lose. (My mother weighed 261 pounds.) A few weeks in, my trainer, Jillian Michaels, asked, “Why are you here?” “Because I’m fat,” I answered. “Why are you fat?” she responded. The truth was my fat protected me. 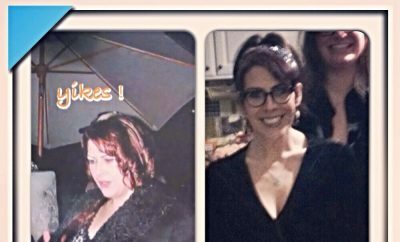 My weight was the reason my relationships ended or I didn’t get a job–or so I told myself. It was an excuse for my failures. When we worked out in the gym, Jillian often separated teammates. Once, she put my mom on the bike and screamed at her to push harder; I watched from my spot on the elliptical. I wanted to protect her. Jillian immediately yelled at me, warning me not to look in my mother’s direction. My job was to focus on me. At that moment, I realized that rescuing my mom was not the answer to her problems–or mine. I loved her, but old issues were surfacing that I had to address, and I knew I couldn’t change if I held on to so much hurt. One afternoon, prompted by Jillian, I told my mom how alone I felt growing up. Mom’s defenses were down–she apologized for some of the choices she’d made. “I love you more than life,” she said. “Why else would I come to this dumb old place? I wanted to be with you.” It was what I needed to hear. After 4 weeks on the ranch, my mom and I were eliminated and sent home. We were a combined 73 pounds lighter, but I wasn’t sure I’d have the strength to avoid temptation, so I cleaned out the refrigerator and stocked it with what I ate at the ranch: veggies, lean meats, whole grains, and low-fat dairy. I also made changes at work: At the salon where I was a hairdresser, I used to take clients nonstop all day. I’d drink lattes and soda and scarf down fast food whenever I had a minute. But after the ranch, I made time to sit down and eat my lunch, and I no longer jumped up to handle a walk-in client. I was taking care of my needs–and that time was sacred. I’d been home for about 7 weeks when the show’s producers called, saying they were giving all the eliminated contestants a shot at getting back on the ranch. When I hung up the phone, I looked at my mom and announced, “I’m going to be the first female Biggest Loser.” And in April 2008, in front ofAmerica, it happened. I won, and it was the moment of a lifetime. I’d spent so much energy on losing weight, and now it was time to look at the bigger picture. I called Mark Koops, managing director of the company that produces the show, and asked if we could meet. And he said yes! I told him about all the women who e-mailed me thanking me for changing the consciousness ofAmerica–and I wanted to stay a part of that. Mark told me he’d been waiting for a woman to walk through his door who wanted to make a difference. Working with the show and other sponsors, I now speak at events and try to motivate women who want to change but don’t think they can. My life with my family is completely different: We hike together now and enjoy healthy dinners. And my relationship with my mom is the best it’s ever been. Sure, we still have our ups and downs, but we’ve learned to talk through our conflicts. Every person in my family helps support my lifestyle. In fact, our first Christmas after I came home from the ranch, we took our holiday vacation toMexico, and to help me stay on track, my family created healthy menus for the trip and split up cooking duties. There wasn’t a gym around, so I did basketball drills with my brothers, and we danced on the patio after dinner. We even exchanged gifts that promoted health, like heart rate monitors and workout equipment. They really rallied behind me, and I’ll never stop drawing from that. Today I maintain my weight by finding balance. I eat the foods that I love, but I still keep a food journal in my handbag. And while I don’t spend endless hours at the gym, I do exercise in some way almost every day because it gives me energy, and I love how I feel afterward. In the end, I’m just a normal person who experienced an extraordinary journey–one that happened to be on national television. I want to lead by example, and I’m an example of what believing in yourself truly means.